Norway protests to Britain over violation of neutrality. Off Ireland, U-101 sinks British freighter Gairsoppa (85 killed) carrying 2800 bars of silver to fund war (110 tons of silver were recovered in 2011). German vessel disguised as a British merchantman is reported sunk by a U-boat off Azores. 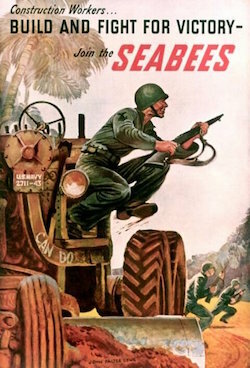 First Seabees arrive in the Pacific, on Bora Bora in American Samoa to build an airfield. In Singapore, Japanese send 3,000 British civilians to Changi prison and 50,000 British, Australian, and Indian POWs to Selarang Barracks. Japanese invade Bali, despite allied naval interception and bomb Darwin on Northern Australia. The Eighth Army occupies Medenine in southern Tunisia. 5th Panzerarmee’s advance beyond the Kasserine Pass is temporarily suspended. In Tunisia, US evacuates Fériana & Thélepte Airfields; Germans occupy the airfields and the towns of Sbeïtla and Kasserine. Baseball player Joe DiMaggio of the New York Yankees enlists in the US Army. Aircraft carrier USS Lexington (CV-16) is commissioned at Quincy, MA. German troops encircled in the Cherkassy pocket achieve a breakout, but at a heavy cost in men and equipment. The Russians claim the annihilation of the trapped German divisions at Korsun. They also begin to storm Krivoi Rog. US Army & Marines land on Eniwetok Atoll in Marshalls. Operation Hailstone begins as U.S. carrier-based planes bomb the Japanese naval base at Truk in the Caroline Islands. The U.S. Third Army launches a new offensive into Germany, having pierced the Siegfried Line on an 11-mile front. U.S. troops capture the whole of the Bataan Peninsula, which commands Manila Bay in Philippines. Gen. MacArthur’s troops land on Corregidor in the Philippines. 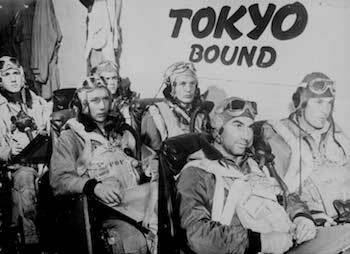 For the second day in a row, carriers of US Fifth Fleet hit Tokyo.